Point Pleasant head football coach David Darst, left, breaks a smile while talking to his players during a Nov. 18, 2017, Class AA playoff game against Bluefield at Mitchell Stadium in Bluefield, W.Va.
LOST CREEK, W.Va. — Another milestone for the Point Pleasant football program. Eleventh-year PPHS coach David Darst picked up his 100th career victory on Friday night as the Big Blacks led wire-to-wire during a 58-7 thrashing of host South Harrison in a Week 2 non-conference football contest in Harrison County. The visiting Big Blacks (2-0) built leads of 21-0 after one quarter and 38-0 at the intermission, then expanded the lead to 45-0 less than three minutes into the third canto. The Hawks (0-2) finally cracked the scoreboard with 7:39 remaining in the third as Jaren Robinson broke away for a 19-yard touchdown run, pulling the Orange and Black back to within 45-7 with just under 20 minutes left in regulation. The Red and Black went on to add a Hunter Bush two-yard touchdown run with 2:05 left in the third for a 52-7 cushion, then Brayden Connolly added a 33-yard touchdown run with 6:15 left in regulation to wrap up the 51-point triumph. PPHS senior quarterback Cason Payne had another monster night, throwing for 160 yards and four touchdowns on 9-of-15 passing. Payne also rushed for 59 yards on five attempts. The Big Blacks amassed 490 yards of total offense — including 310 rushing yards on 30 attempts — while limiting the hosts to just 113 yards of total offense. Point also secured a 19-5 advantage in first downs and finished the night even in turnover differential. Brady Adkins started the scoring at the 5:25 mark of the first quarter with a five-yard run, then Payne found Josh Wamsley with a nine-yard TD pass at the 3:44 mark for a 14-point lead. Payne followed with a 46-yard scoring pass to Andrew Jones with 51 seconds left en route to a 21-0 cushion. Jones hauled in a second TD pass from Payne at the 5:42 mark of the second as the senior covered 46 yards to paydirt, making it a 27-0 contest. James Musgrave caught the final Payne TD pass on a 27-yard strike at the 2:53 mark. Payne then found Aiden Sang on a two-point conversion pass that made it a 35-0 contest. Oliver Skeie — who was 5-for-7 on extra-point kicks in the contest — tacked on a 27-yard field goal just before the half ended, allowing the Big Blacks to take a commanding 38-point advantage into the break. Adkins scored from six yards out at the 9:22 mark of the third period for a 45-0 edge. Adkins led the guests with 100 rushing yards on eight carries, with Connolly adding two carries for 43 yards and Nick Parsons chipping in 31 yards on three totes. Wamsley led the Point wideouts with three catches for 42 yards, followed by Jones with two grabs for 81 yards. Riley Oliver also hauled in two passes for 20 yards. The Big Blacks did not have a punt in the game and were penalized only four times for 20 yards. Brenten Barnette paced the Hawks with 30 rushing yards on four carries, with Landon McFadden following with 28 yards on 11 tries. Robinson ran eight times for 20 yards and was also 3-of-7 passing for 58 yards. McFadden caught all three passes for 58 yards. The hosts punted the ball six times for an average of 31 yards. SHHS was also flagged five times for 30 yards. 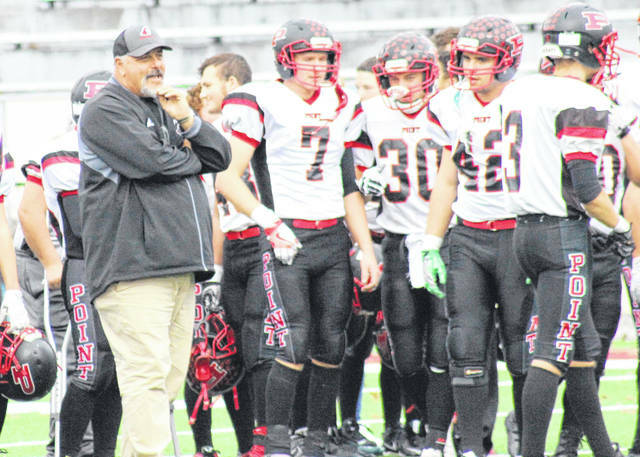 Darst — who is responsible for leading Point Pleasant to 10 of its 15 playoff berths — joins Steve Safford as the only head football coaches in PPHS history to amass triple digits in the win column. Safford holds the program’s all-time mark with 164 victories. The unbeaten Big Blacks will make their Ohio Valley Bank Track and Field debut Friday night when they host Warren Local in a Week 3 non-conference tilt at 7:30 p.m.